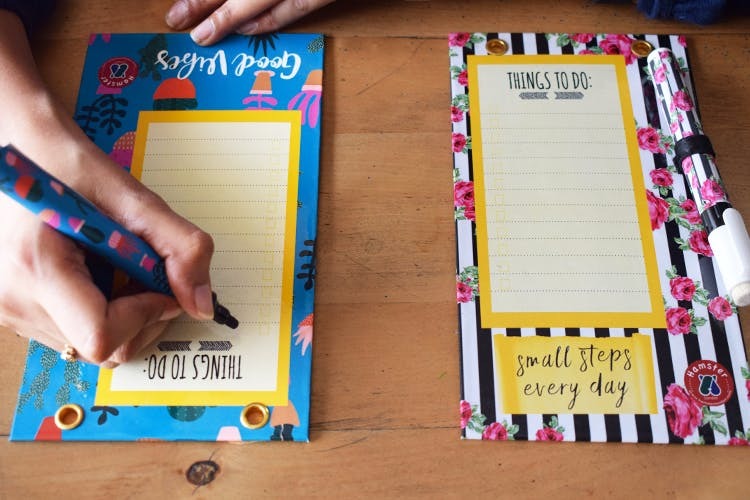 This white board is so handy to keep in your room or office to scribble reminders or notes. It's also magnetic so you can pin up pictures or anything else you want. With pages in five different colours, this diary is perfect for you to pen down your thoughts or to sketch in. They're all blank so you can use it for pretty much anything. Stationery all over the place. Carry everything in this silicon pouch, it's cute, holds everything together and the best part is, the material doesn't let it get dirty. So it stays smudge and stain-free. This lead pencilI is soft, has a latex-free grip and a twist-up eraser. It can store up to four leads at one time and requires a refill when they're used up. You get a pack of nine small magnets for your fridge (or your new magnetic board). Use them to pin up pictures, cards or anything else on your fridge.